I suppose I could wish that I were younger, but then I wouldn’t be able to say I grew up in the 1960s and 70s. I drank Tang for breakfast (just like Neil Armstrong), had a crush on most of the Monkees (especially Davy Jones), rocked a pair of purple crushed velvet hot pants to my cousin’s wedding, and yes, my prom date wore a leisure suit. When I want to transport myself back to those decades I channel surf on my radio between the 60s and 70s stations. One of our old prom theme songs came on yesterday while I was driving. The junior class always chose a popular song as the prom theme, the sophomores had to perform the song at the banquet, and the seniors just got to come and eat and have fun. Our sophomore year the juniors chose “Stairway to Heaven.” I do recall being quite thrilled to play the opening flute solo, wearing my blue gingham checked Gunne Sax brand prom dress. I don’t recall how the vocals went. I suppose “Stairway to Heaven” had lots of decorating opportunities with stars and stairs to the gym ceiling but I found it a bit creepy as a prom theme. No doubt I weighed in on the prom theme the next year, 1976, when we were juniors. Not only did I weigh in but I remember being the one to write the theme on the backdrop wall for the banquet. “We May Never Pass This Way Again.” That sure has a ring to it, doesn’t it? I think I even drew it free hand without the use of an overhead projector (if you know what one of those is). Admittedly “We May Never Pass This Way Again” was not the classic rock hit that Led Zeppelin’s “Stairway to Heaven” was. It was a 1973 tune by soft rock duo Seals & Crofts that reached moderate success. You may only know this song if you also drank Tang and wore Gunne Sax dresses or dated someone who did (extra points for playing a band instrument). 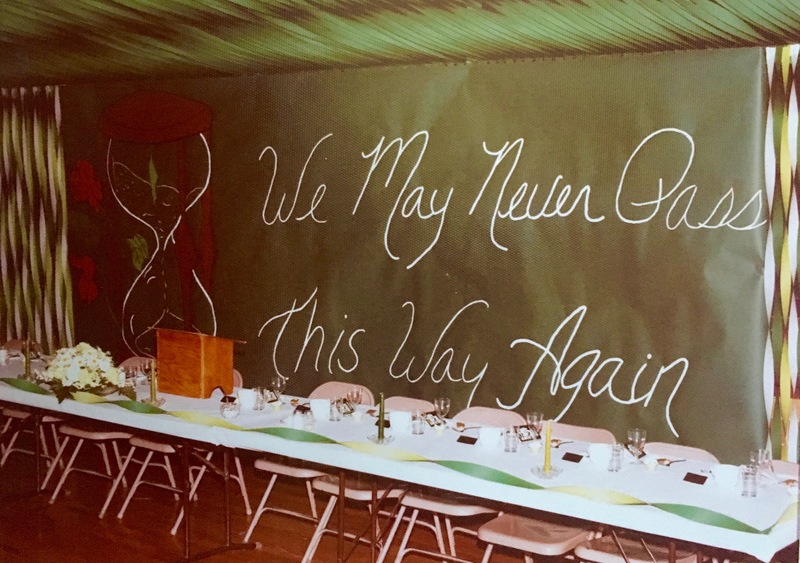 Hearing it on the car radio last week prompted me to find a photo of this prom wall mural from my high school photo album. There was a part of me that felt like getting out a big roll of green paper and free handing these words in white paint and hanging it up on the outside of my house for all to see, then some smaller ones posted on the television screen, my computer, the fridge, my bathroom mirror, my phone, and the dashboard of my car. Really quite wise words chosen by sixteen year olds to honor their high school seniors. A quite timeless admonition stated very politely. Seals & Crofts could have just dropped the “may” and frankly stated “We Will Never Pass This Way Again.” Because, you know, we won’t. Back in 1976 I was busy trying to ignore the fact that my mom was dying of cancer but I think this theme selection shows that I was more aware than I let on. I wrote about that life changing experience in my Perspective post. Over forty years later this prom theme haunts me. Have I lived my life with this kind of awareness and maturity and honoring of the nimbleness of life? Have I been present to the life that is passing before me? Last week I spent a lot of time cooking lunches and running errands with my son who was getting ready to move to college for the first time. I felt like super mom totally spending unhurried time with him. I was totally present and practicing mindfulness, to borrow a couple of nursing interventions. (It’s a handy occupation to have). One lunchtime I was preparing his go-to favorite, grilled cheese sandwiches. He ate the first one and asked for another. I got a great “do” on the second one. The sandwich was golden brown on both sides. I delivered it to his plate and returned to make one for myself. Then I heard him say, “Mom, there is no cheese in this grilled cheese sandwich.” What? There it was on his plate, basically two pieces of dry toast stacked on top of each other. So much for being present and mindful. The next night as we shared our last good night hug, we didn’t miss a beat. We were both fully present, mindful and grateful when it mattered most. Time almost stood still for a minute. And so it goes. This has been my life for the past 40 years since I went to my junior prom and said my final good byes to my mom just two months later. That haunting reminder of “we may never pass this way again” is sometimes remembered but often pushed aside by distractions and goals and routine. I read recently that we should pay attention to our feet. Wherever our feet are, is where we are right now. It grounds us. It sounds too obvious but often those simple laws of physics are the most powerful. Who is within speaking distance of you right now? Who can you listen to? What story is within your reach? One of my favorite images from the Bible is that of a lamp. I picture an oil lamp with its wick trimmed and burning, but only lighting a few feet around me because that is all that is needed. As I move forward the light follows me, or more importantly it directs me where my next steps should go. As the Psalmist writes, “Your word is a lamp to my feet and a light to my path”. Psalm 119:105. As the Seals & Crofts song builds in totally 70’s pop fashion (which I love) it reminds us to “gather all our courage and sail our ship out on the open sea” because, well, the title of the song. I know I won’t get it right everyday. I’ll forget the cheese in the sandwich or let years nimbly slip through my fingers as I wonder where the time went. But I know for certain that God’s word will provide the forgiveness to move forward and the lamp to light the way.  Archived in words and tagged being present, mindfulness, words. Bookmark the permalink. Very thought provoking. Thank you for sharing. PS – we always wanted Tang but Mom wouldn’t buy it…. something about trying to feed 9 kids (and assorted cats and dogs) and still having money to pay the bills. We are the same vintage! You weren’t missing much. Tang was nasty! Ha! Great to hear from you, Ruth!